Somebody should tell the terrorists that they can't use their iTunes weapons anymore, or Apple will go medieval on their asses. 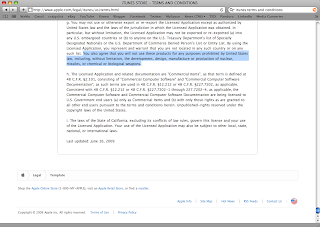 In the fine print of the Itunes Terms and Conditions there is an article stating the you cannot use iTunes for creating Nuclear Missiles or biological weapons???!! My biggest question is how? then, why? then, really? "Warning: Contents are Hot, Do Not Use For Biological or Nuclear Weapons, Caution: May Cause Choking, Cuation: May Make you Fat, Warning: May cause Fry Drama, Warning: Golden Color is Just A Color No Cash Value"
So remember, if you plan on killing the world with your Nuclear or Biological weapons, don't groove to fat beats while making those missiles. The more you know.